I am looking for an Applause pink elephant Item no. 48284 for a child who was badly hurt during Hurricane Ike. Her stuffed animal was almost destroyed, so we are trying to get a replacement to speed her recovery. 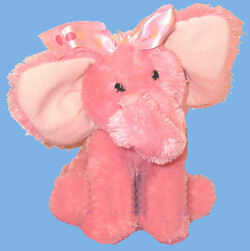 If you can help Danielle find this Applause Pink Elephant No. 48284, THIS SITE IS NO LONGER ACTIVELY MANAGED. Please use Our FREE FACEBOOK GROUP, including #091808-2 in the subject, . I believe this is a Russ Berrie Applause elephant. I found this picture. Ebay 350075217933. It has ended, but that should be the right one. You can check. Maybe you can get the pic. Thanks Tami. They sold several of these, so I have written them in case they have another one. Haven’t heard back from the family, but I don’t want to bother them, as they are bound to be very busy right now. I already check, that store doesn’t have another. THANKS! I’ll grab the pic then. Could not see any of your pictures but thought this one sounded like what you are looking for. It’s the same one, but I’m glad you reminded me of the picture!!! It’s been a busy, busy week. I saw this elephant in the featured Top Priority box on the side. Are we still looking for it? I’ve changed this post to Discontinued, because I have not been able to contact Danielle.